Yako Hanna, 36, always keeps an eye on his phone waiting for a call that would change his life. Once in Turkey, Hanna registered with UNHCR and the Turkish government. Under Turkish law, only asylum seekers from Europe qualify for refugee status. Iraqis are eligible to receive what is called an “international protection” status, which allows them to stay in Turkey as they wait for resettlement to a third country. Being resettled is not easy or quick. According to UNHCR, in 2015, there were more than 7,500 people resettled out of Turkey; more than 6,400 were from countries other than Syria. Turkey hosts more than 3 million refugees; about 400,000 are non-Syrians. Although the exact number of Iraqi Christians in Turkey is unknown, it is estimated that there are at least 40,000. For Hanna, the process to officially become a refugee and seek resettlement involved paperwork, travel and multiple interviews. His file was finally completed July 21, two years after he landed in Turkey. When they met with Canadian officials, Kamil felt closer to her dream of finding a safe home for her family. After that interview in October 2015, Kamil was told that the next time she would be contacted, it would be for her to move to Canada. “And since then, we are waiting,” Kamil said. In this image from 2015, worshipers pray at Immaculate Conception Catholic Church in Suez, one of the churches attacked in Egypt after the political upheaval there in 2013. 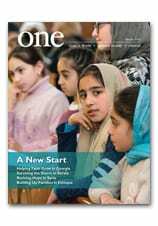 To learn about the efforts to rebuild, read Out of the Ashes from the Spring 2015 edition of ONE. Peshmerga forces advance 18 October to attack Islamic State militants in Mosul, Iraq. Some of most memorable people we have encountered over the years have been not only heroes, but survivors. Ivlita Kuchaidze survived famine, World War II, the Cold War, the Georgian civil war and the country’s turbulent early years of independence. But, at 93, she may be facing her hardest challenge yet: Along with an estimated 400,000 other Georgian citizens, Ms. Kuchaidze endures a life of abject poverty. After decades spent caring for others, Ms. Kuchaidze has become one of the thousands of pensioners who must depend on charity to survive. “How do I live right now? In the cold. Hungry. Everything has gotten so expensive,” she says. ...Hers is the story of so many Georgians of her generation — defined, in large part, by jagged contours of the rise and fall of the Soviet Union. It is the story of perseverance in the face of oppression, of holding on to hope in spite of every imaginable hardship. It is a story of longing and loss. Read more about her remarkable life here. CNEWA is privileged to work with Caritas in helping to support “new orphans” like Ivlita Kuchaidze, people who once lived a secure and comfortable life but who now find themselves forgotten or alone — yet still holding fast to their dignity, uplifted by the faith that sustains them. To learn how you can remember those others have forgotten, visit this link. In Lebanon, "Life Has to Go On"
When a series of bombs exploded in a Lebanese Christian village near the Syrian border in June, it not only changed the lives of the victims and their families, but also the lives of Syrian refugees living nearby. Four suicide bombers hit the town square of Qaa in two separate incidents 27 June, killing themselves and five residents and wounding more than 30 others. It shook up the relatively quiet frontier area, highlighting its vulnerability as bordering a part of Syria controlled by the Islamic State group. Since then, the area’s growing Syrian refugee community of around 30,000 has been under tight security. Hundreds have been arrested on suspicion of having connections to the attacks, and the residents of the agricultural area called Qaa Projects, which has become a vast informal tented settlement, now require government permission to leave the area. In this image from April, a woman prepares tea in a camp for internally displaced families in Ain Kawa, near Erbil, Iraq. Residents of the camp were displaced from Mosul and other communities in Iraq when ISIS swept through the area in 2014. On 17 October 2016, a battle began to retake Mosul from ISIS — sparking both hope and concern among displaced Iraqis. Iraqi Christians are cautiously welcoming the start of the battle for Mosul and the Ninevah Plain, their ancestral homeland of the past 14 centuries from which they were brutally driven out by the Islamic State group more than two years ago. “They’ve been waiting for this day after being forced out in the summer of 2014, and many Christians have been living in very miserable conditions since. A number are eager to go back,” Father Emanuel Youkhana told the Catholic News Service. The archimandrite, a member of the Assyrian Church of the East, heads the Christian Aid Program Northern Iraq, CAPNI. This summer, the U.N. said that as the Mosul crisis evolves, up to 13 million people throughout Iraq may need humanitarian aid by the year’s end — far larger than the Syrian crisis. This would make the humanitarian operation in Mosul likely the single largest, most complex in the world in 2016. The Kirkuk Archdiocese has taken in and ministered to hundreds of Iraqi Christians displaced by the brutal attacks of the Islamic State militants, who demanded Mosul residents leave their homes and businesses, convert to Islam or be killed. Prior to the Iraqi military’s capitulation to a small group of Islamic State fighters in 2014, Mosul was inhabited by more than 2 million people. It’s believed that only about 1 million residents remain today. Some 130,000 have fled to other areas within Iraq, such as Kirkuk or Kurdistan. Thousands of others are being housed in neighboring countries, such as Jordan and Lebanon, while perhaps hundreds have been resettled or are awaiting resettlement in the U.S., Australia and Canada. Some live in cramped conditions in church basements. Caritas and other Catholic organizations have been working to help them. International humanitarian organizations are warning that Iraqis, mainly Sunni Muslims, left in Mosul are “now in grave danger.” The Norwegian Refugee Council, Save the Children and others are urging the establishment of safe exit routes for civilians to flee the city. “Unless safe routes to escape the fighting are established, many families will have no choice but to stay and risk being killed by crossfire or bombardment, trapped beyond the reach of humanitarian aid with little food or medical care,” said Aram Shakaram, Save the Children’s deputy country director in Iraq. “Those that try to flee will be forced to navigate a city ringed with booby traps, snipers and hidden land mines. Without immediate action to ensure people can flee safely, we are likely to see bloodshed of civilians on a massive scale,” Shakaram warned. The humanitarian groups criticize instructions from Iraq’s military urging inhabitants to hunker down inside their homes. At best, this is impractical in a brutal urban conflict, the groups say. At worst, it risks civilian buildings being turned into military positions and families being used as human shields, they argue. But even if people do manage to flee, they also face some uncertainty. Although aid agencies have been preparing for months, observers believe camps for the internally displaced are ready for perhaps some 60,000 people, and these camps could be overwhelmed within days. The U.N. Office of the Coordinator for Humanitarian Affairs reported it is locating additional land for extra camps to be set up. It reported that construction of additional sites, with capacity for 250,000 people, is underway. Food rations for 220,000 families are ready for distribution, 143,000 sets of emergency household items are in stock; latrines and showers are being readied for dispatch and 240 tons of medication are available at distribution points. But funding toward a flash appeal has been insufficient to prepare fully for the worst-case scenario. Even if the operation rids the area of Islamic State, Archbishop Mirkis said a number of Christians have serious concerns about returning home without iron-clad guarantees for their future safety. “Who can give such assurances? Maybe the big countries. But those who suffered the most are the Yezidis. The Yezidis and all the minorities face the same problem. How can we have peace with neighbors who looted our houses?” he asked. He also expressed concerned for civilians inside Mosul. “All those children, elderly and civilians are caught like in a prison. We have to think about them too. We have to read the book of Jonah. It can explain many things to us,” the Catholic Chaldean leader said. Iraqi Kurdish Peshmerga fighters deploy on the top of Mount Zardak, about 15 miles east of Mosul, as they take part in an operation against ISIS on 17 October 2016.